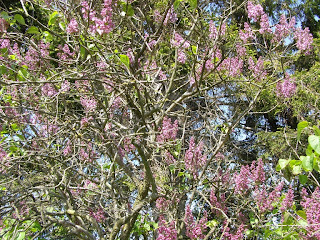 Budding lilacs with pine in the background. May 18 is Bike To Work Day in Bellingham, but some people might feel it's another obligation. "As if work isn't enough, now they expect me to bike there after working overtime and so forth," some will say. So, bike away from work. For some people, piling a bike trip on top of an already overburdened day is just another "should do." For others it's a relaxing and refreshing change from sitting at work. A breath of fresh air and a way to stretch one's legs. For some, biking will be a treat to and from work, but it isn't the same for everyone. Biking away from work is an answer also. That means using the bike for recreational trips such as weekends or after work. Biking when there isn't as much pressure to "get there on time" can be a joy. Americans tend to be overworked anyway. For some, the bike would just be another task. For others it's a welcome break from the tasks. As a culture, we could also use more vacation time and break from the work-a-day world. If nothing else, better health could be justified in terms of increased productivity and lower medical costs, but why turn all our choices over to the bean counters? Maybe we should just bike for the fun of it. If one finds it too much of a burden to bike to work, how about biking more on your time off? As long as it's biking, it's good. Personally, I live so close to my job that there is no point carrying my bike down the stairs to ride it that short distance. I just walk to work. My biking is during time off work. I've biked across America, but one doesn't even have to be capable of that. Just biking anywhere is worth while. Spring is starting to unfold. See a Bike To Work page in my web site.